This is my first post in months and I am excited to start with something new in my household. A new oven! This oven came with the house when we bought it on 2003, and it served us well until month ago. It started turning off by itself and as much as I loved it, I needed a new one. Like what Ms.Streisand said, "some good things never last." It was like ending a good relationship. I honed my kitchen talent with that oven so I thankfully said goodbye to my it by baking one last dessert. I found this delicious looking cake from Smitten Kitchen and tweaked some ingredients for my liking and what I have available on that day. The original recipe is made with blackberries, blueberries, and raspberries. I ate all my blackberries two days before I decided to make the cake (and too lazy to go run to the store) I settled for just rasp and blueberries that day. To make up for the lack of berries, I added orange juice instead:) I also opted in for simple glaze instead of what she had on her recipe. 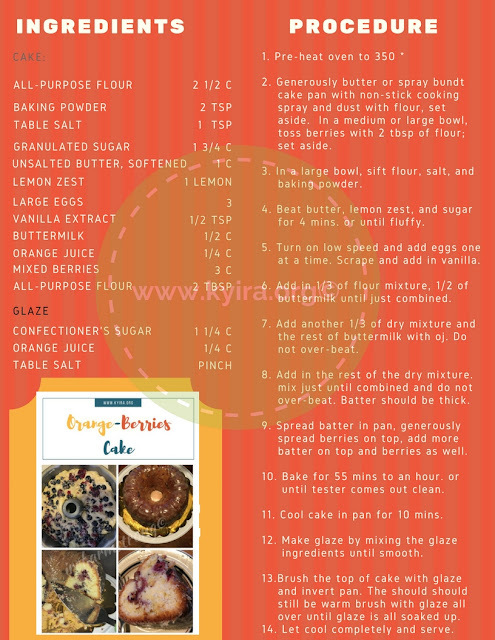 So without further ado, here's the tweaked recipe for what I call Orange-Berries Cake. I know that I will have plenty of time baking with my new oven and hopefully it will last just as long, if not longer than my old oven. Please do try this recipe of feel free to visit the original recipe. Ta.ta. for now!